Lock in a great price for Hotel Arcanjo - rated 9.2 by recent guests. Balcony within the room with sea view. Room cleaning every single day. Towels change if necessary. Good buffet breakfast. Free space for parking the car. Perfect location close to the main highway. Breakfast was good as well as the hotel location which is near the ocean. We could always find a parking spot. Everything was clean and the staff was very friendly and helpful all the time. Value for money was great! Strongly recommend it. The staff was very nice and friendly. They helped us a lot - they printed flight tickets for us for free, they borrowed us beach towels for free. The hotel was very very clean. Breakfast was good (but we missed vegetables). We were very satisfied with this accomodation! We stayed here for one night before our return flight, it was a perfect location for the airport. Room was clean and comfortable, great value for money with breakfast provided. Even provided hot milk at breakfast for coffee. As a bonus we had a great view of the ocean. Close to rhe sea and shopping. Walking distance to a couple of restaurants which was important to us due to some walking issues. Staff were great and managed to move us to a larger room and no additional cost. Free parking in the hotel’s small parking lot and on the street. Fairly close to the highway for sightseeing. A good basic breakfast was included. All staff were friendly and couldn’t do enough for you. More attentive than a 4 star we had stayed at the previous week on another island. The soundproofing basically isn't there, you could hear all the walking, mumbles from a chatter. It was really loud, especially when the neighbors opened a water or when they took the shower. Also the window isn't really soundproofed. Small TV. Amazing family run hotel with the best value for money. My husband and I have been travelling for the last year and this hotel gives by far the best customer experience. Staff here is extremely kind, attentive and they will do everything to make your stay incredible. I am gluten and lactose intolerant and they managed to get me gluten free and lactose free products for breakfast. Breakfast is overall excellent and offers a great variety of local products. Adding to this, on our last day we had a very early flight and we got surprised by a massive takeaway breakfast left in our room (see pic). Thank you so much again, you are incredible! Cleaning-wise this place is spot on and the room has all necessary comforts. Beach towels are also provided free of charge. Location is perfect to visit the main spots. We cannot recommend this place enough. The breakfast is nice! The staff very lovely and helpful! 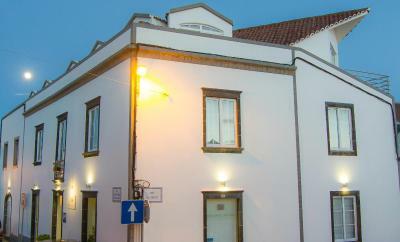 Hotel Arcanjo is housed in a 19th century building that combines traditional and modern design. 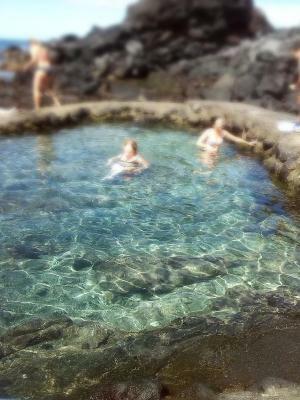 It is ideally situated 50 yards away from the beachfront, south of the São Miguel Island. Hotel Arcanjo offers comfortably furnished rooms with views of the ocean and surrounding area. Guests can make free use of the hotel’s parking and WiFi service. Breakfast is served in a buffet style and for lunch and dinner guests can easily select one of the many restaurants in São Miguel. The friendly staff can assist guests with arranging activities that include tours, whale watching, horseback riding, and diving. Guests can also enjoy walks around the village of Lagoa and visit the factory of ceramics, beautiful churches, and the small fishing port. 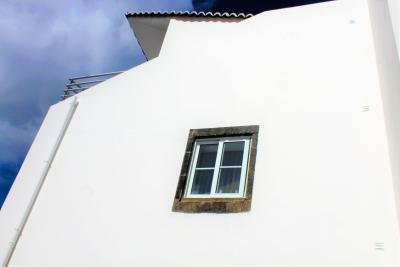 This property is also rated for the best value in Rosário-Lagoa! Guests are getting more for their money when compared to other properties in this city. Hotel Arcanjo has been welcoming Booking.com guests since 31 Mar 2010. Good for couples - they rate the facilities 8.6 for two-person stays. When would you like to stay at Hotel Arcanjo? This room comes with twin beds, that can be joined or separate. It also comes with air conditioning a desk and cable TV and a telephone. The room includes a private bathroom. Free! Free public parking is possible at a location nearby (reservation is not needed). House rules Hotel Arcanjo takes special requests - add in the next step! The maximum number of children allowed in existing beds is dependent on the room you choose. Please check your selected room for the maximum capacity. Hotel Arcanjo accepts these cards and reserves the right to temporarily hold an amount prior to arrival. Parking can be limited although we managed fine. The breakfast room can get squashed as there probably aren't enough tables but generally hard to fault this place. Just be warned that there is no elevator. There is also no refrigerator, not even a bar style fridge in the room. I would highly recommend that a small fridge be added to the larger rooms. There were some terrible storms for a couple of days. The rather basic windows allowed for high wind noise and some moisture to seep through. Staff did their best with wrapped towels on the crevices, and moved us to a better room when one became available.